ANAHOLA, KAUAʻI – Kauaʻi welcomed the first Hawaiian homesteaders of 2017 into its Pi’ilani Mai Ke Kai community in Anahola this past weekend. These 20 homestead ʻohana joined the Department of Hawaiian Home Lands and dignitaries at a lot selection ceremony Saturday, January 21, 2017 at King Kaumuali’i Elementary School Cafeteria in Hanamaulu. 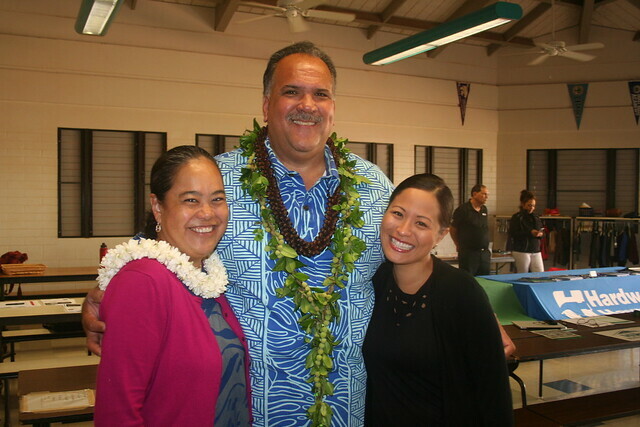 Newly-elected Hawaii State Representative Nadine Nakamura (District 14) along with the Honorable Bernard Carvalho, Jr., Kauai County Mayor, Mel Rapozo, Kauai County Council Chairman, Carrice Gardner, Governor Ige’s Representative and Hawaiian Homes Commission Chair Jobie Masagatani congratulated 20 Hawaiian homes beneficiaries who were eligible to select from the 22 available lots in the DHHL’s homestead community of Pi’ilani Mai Ke Kai. The lot awards in the Pi’ilani Mai Ke Kai subdivision of Anahola follows closely on the heels of the awarding of 31 lots in the Waimanalo homestead of Kaka’ina late last year. The revitalization of the vacant lot program is the department’s direct response to beneficiary requests for additional options to meet their individual family needs as well as their financial capabilities. The department broke ground on the Pi’ilani Mai Ke Kai residential project in Anahola, Kaua’i in August 2006. At its inception, this 71 acre DHHL subdivision development offered 171 homestead lots with a minimum size of 10,000 square feet. The 22 lots being awarded are the last available vacant lots in Phase I of the Pi’ilani Mai Ke Kai subdivision with another 51 vacant lots set to be awarded in Phase II later this year.